16th-century blind stamped and ruled calf, W.G. stamped on center front and back covers, brass clasps, portion of one clasp missing, a few leaf edges gnawn. Purchased from Richard E. Priest, 1994. W.G. ; Eustace F. Bosanquet (bookplate on front pastedown); Albert Ehrman (bookplate on front paper flyleaf); H.P. Kraus, New York; purchased by Richard E. Priest from H. P. Kraus in 1973; Priest MS 2; purchased from Priest in 1994. 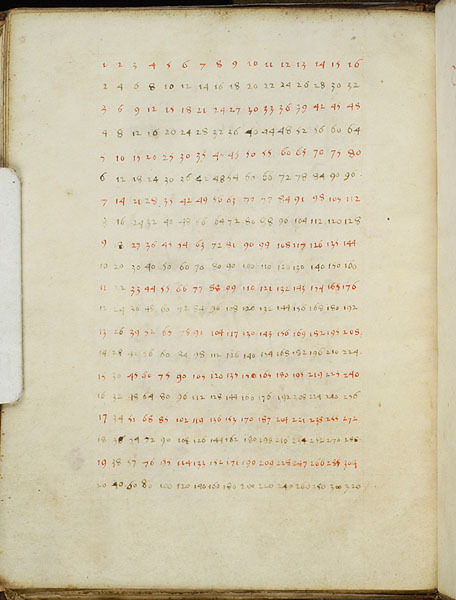 Ms. calendar and computational tables and texts; written in England, ca. 1551. Text: fols. 1-2 - blank; 3 - list of contents; 4 - cut away; 5-6 - calendar and explanations; 7-8 - dominical letter table and explanation; 8v-9v - golden number table and explanations; 10-11v - table of moveable feasts and explanation; 12-13v - epact table and explanation; 13v-15v - determination of the age of the moon using the epact; 16-19 - table of the number of hours the moon shines after sunset, times of moon rise and moon set, and explanation; 19v-23 - table of zodiacal position of the moon and favorable times for blood-letting, purging, and bathing, and explanation; 23v-26v - table and explanation of times of daybreak, rising of the sun, length of the day, sunset, twilight; 27-30 - table and explanation of times of full and ebb tides; 30v-31 - multiplication table up to 20 x 16 with explanation; 32 - ruled but blank. The 37 leaves include 2 ruled but blank at front, and 4 blank leaves at the end.